Newcastle and Carlisle Railway, a.k.a. Tyne Valley Line, from Carlisle to Newcastle upon Tyne. Beautiful detailed landscape and many details trackside. There are no less than 13 alternatives to run all or part of the route, with different train classes. 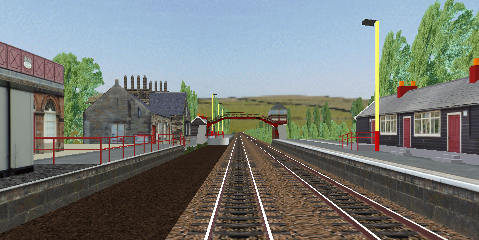 This route uses 3rd party object to simulate British light and semaphore signals. These objects were created by Simon Gathercole and Anthony Bowden. The website on which this objects packages were distributed has disappeared from the Internet longa ago. However there are archive files with these to download below from this website. The unpacked directories BrSema4Sigs and BrSigs should be placed in the directory LegacyContent\Railway\Object . The creator's website has disappeared from the Internet.